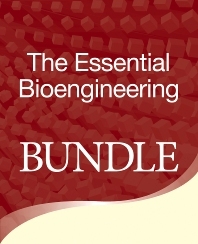 Including two must-have titles, this essential bundle places numerical problem solving methods at the fingertips of future and practicing bioengineers. Numerical Methods in Biomedical Engineering brings together numerical modeling fundamentals and applications essential to bioengineers. Covering biomechanical phenomena and physiologic, cell and molecular systems, it is a must-have tool for bioengineering students and professionals alike. Essential Matlab for Engineers and Scientists, 3e is THE guide to MATLAB as a problem solving tool. Introducing the fundamentals of MATLAB and its potential, it will help you avoid common mistakes and pitfalls, and to master the power of MATLAB. Get up to speed with solving complex engineering and scientific problems using numerical methods and software systems, as quickly and cheaply as possible. Dr. Dunn joined Rensselaer Polytechnic Institute in 2008 as Vice Provost and Dean of Graduate Education and full Professor in the School of Engineering. Dunn’s experience includes developing university-wide initiatives in such areas as packaging engineering, water resource management, and homeland security. He also has extensive experience building academic programs, including overseeing the country’s first engineering-based clinical training program in prosthetics and orthotics. Dunn has mentored 14 Ph.D. students, 23 M.S. students, and many undergraduate students. These students have come from biomedical engineering, electrical and computer engineering, computer science, mathematics, dentistry, as well as the M.D./Ph.D. program. The author of three books and 150 papers on different subjects including digital subtraction radiography, Dunn is a fellow of the American Institute of Medical and Biological Engineering. He is the founding editor-in-chief of the Journal of Applied Packaging Research, and has served as an editor and officer of several journals and professional organizations. Prabhas Moghe is Distinguished Professor of Biomedical Engineering at Rutgers University. In addition, he holds graduate faculty appointment in the Graduate Program in Cell and Developmental Biology at Rutgers/UMDNJ. He has served as Undergraduate Program Director in Biomedical Engineering and currently directs the NSF IGERT Program on Integratively Engineered Biointerfaces at Rutgers. A Fellow of the American Institute of Medical and Biological Engineering (AIMBE) and a recipient of the NSF CAREER Award and several teaching awards at Rutgers, Dr. Moghe has an active research program in the areas of cellular bioengineering; micro- and nano-systems bioengineering; and cell-interactive biomaterials. Brian Hahn was a professor in the Department of Mathematics and Applied Mathematics at the University of Cape Town. In his career, Brian wrote more than 10 books for teaching programming languages to beginners. Daniel T. Valentine is Professor Emeritus and was Professor and Chair of the Department of Mechanical and Aeronautical Engineering, Clarkson University, Potsdam, New York. He was also Affiliate Director of the Clarkson Space Grant Program of the New York NASA Space Grant Consortium, a program that provided support for undergraduate and graduate research. His Ph.D. degree is in fluid Mechanics from the Catholic University of America. His BS and MS degrees in mechanical engineering are from Rutgers University.